Well, looks as if we are being smiled upon for our trip up to western side of the Sierras this afternoon. The forecast is for fantastic weather. Hopefully the fishing will be just as good – more catching than fishing. But either way, it will be good, and good for me, to get out and enjoy the sunshine. A good weekend to all! In all of my digging around for information on fishing in the sierras, I ran across an old PDF document hosted somewhere on the California DFG Web site, that offers something that almost every fisherman at one time or other during their life would have given up their best lure…well, maybe their second-best lure…to have. It is in an old issue of the Tracks pseudo-magazine put out by DFG, which covers fishing and/or hunting depending upon the season it might be published. From Sonora, at junction Hwy’s 49-108; go E 11 mi. to Twain Harte Dr. Turn N, go 1.7 mi. to Joaquin Gully Rd. Turn NE, go 1 mi. ; road curves E at Middle Camp Rd. for 0.1 mi. Turn N on South Fork Rd., go 0.4 mi. to fishing access on left. I know from personal experience that these directions are pretty good (although we take the nephews and kids to another section of the canal). So, in a service to fisherpersons everywhere, I am pulling this information out of the PDF and putting it on my Web site for all to see. You can get to a main page for this info by clicking on the ‘Calif. DFG Driving Directions’ under the “Join In” section of the side bar. From the main page you can jump to the various sections. Categories: Fly Fishing, Uncategorized | Permalink. If you were an 18-year-old police horse in Berkshire, England, commended by the chief constable your work after disorder at a soccer game in 2003, you’d be retired already. If you were an 18-year-old Olympics gold medal, you might have been won by Jay Barrs for archery. If you were an 18-year-old candy, you might be those oh-so dangerous Pop Rocks. If I could offer you only one tip for the future, sunscreen would be it. Scientists have proven the long-term benefits of sunscreen, whereas the rest of my advice has no basis more reliable than my own meandering experience. I will dispense this advice now. Enjoy the power and beauty of your youth. Oh, never mind. You will not understand the power and beauty of your youth until they’ve faded. But trust me, in 20 years, you’ll look back at photos of yourself and recall in a way you can’t grasp now how much possibility lay before you and how fabulous you really looked. You are not as fat as you imagine. Don’t worry about the future. Or worry, but know that worrying is as effective as trying to solve an algebra equation by chewing bubble gum. The real troubles in your life are apt to be things that never crossed your worried mind, the kind that blindside you at 4 p.m. on some idle Tuesday. Maybe you’ll marry, maybe you won’t. Maybe you’ll have children, maybe you won’t. Maybe you’ll divorce at 40, maybe you’ll dance the funky chicken on your 75th wedding anniversary. Whatever you do, don’t congratulate yourself too much, or celebrate yourself either. Your choices are half chance. So are everybody else’s. Enjoy your body. Don’t be afraid of it or of what other people think of it. It’s the greatest instrument you’ll ever own. Accept certain inalienable truths: Prices will rise. Politicians will philander. You, too, will get old. And when you do, you’ll fantasize that when you were young, prices were reasonable, politicians were noble, and children respected their elders. Respect your elders. Be careful whose advice you buy, but be patient with those who supply it. Advice is a form of nostalgia. Dispensing it is a way of fishing the past from the disposal, wiping it off, painting over the ugly parts and recycling it for more than it is worth. Gave up going to the movies today…unusual for me. But so far I have given the dog a haircut and shampoo and uploaded some more albums. (Check the sidebar for a few new ones. Still have to add the narrative.) Next I’ll be ventured out to the backyard to till the vegetable garden. The sun is out (was supposed to rain), so I might as well get to it. Sure hope to get a lot more out of it this year. Last year was sort of a bust, though we did have plenty of tomatoes and a good amount of potatoes. Have to check for volunteers this year as we may be close to having a self-perpetuating potato harvest. The biggest hurdle is ensuring it gets watered enough when I’m not around. Have a great weekend! If all goes well, my son and I will head up to to the cabin next weekend get out for some trout fishing on opening day. (The season east of Hwy 49 is only open from the last Saturday in April to mid-November.) This will be our first time doing so, so it should be fun. I’ve heard tell that it’s easy to limit out before the summer fishing pressure. Figure we’ll try some new areas, maybe Moccasin Creek and Powerhouse Stream. The following waters are scheduled to be stocked prior to opening day, April 29, 2006, if water, weather, and road conditions permit. TUOLUMNE COUNTY: Basin Creek, Beaver Creek, Deadman Creek, Lyons Canal, Moccasin Creek, Pinecrest Lake (Strawberry Lake), Powerhouse Stream, Stanislaus River (Clarks, Middle, North and South forks), Sullivan Creek, Tuolumne River (Middle, North and South forks). I guess the operative wording is if water, weather, and road conditions permit. There is some worry that the water is running too high, though it certainly won’t be too warm. Here’s to hoping for clear weather! As my family and close friends know, I am a bit particular – maybe to the point of having a touch of OCD – when it comes to cleaning my car. 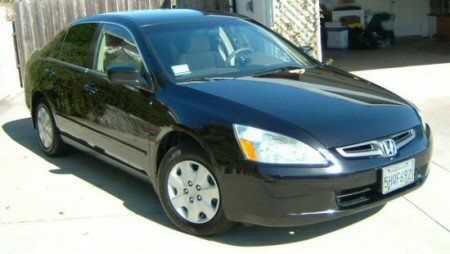 Well, we finally had a sunny day, allowing me to give my “new” car (2003 Honda Accord but new to me) its first through washing, waxing and detailing. My son Chris thinks this car goes “18 dummy” (meaning it’s off the hook, dude). Sometimes it looks a bit sinister to me. Received the registration a few days ago, so soon I’ll be off to DMV to swap the plates to my amateur plates, then I’ll work on the dual-band radio installation. How I came to own this car was summed up by why a fellow co-worker who said that “Pat has never met a new Honda or Toyota that he couldn’t trade in.” The upshot is that I traded a 2006 Civic for this 2003 Accord because the seats in the Civic seemed to be designed for drivers with more delicate derrières. Yeah, one would think I would have sensed this problem in the test drive, but it was oh-so subtle. Sure, the seats were a bit stiff, but having not owned a new car in may years I said to myself, “Self, they’ll soften up over time.” But a week into ownership, I found my right hip was beginning to hurt after my commute, and even the new-car smell did not assuage my feeling that something was wrong. I thought it was the seat padding, so I tried a few things that I thought offer a bit more padding, even though I have plenty o’ padding on my hiney. However, it didn’t help much. 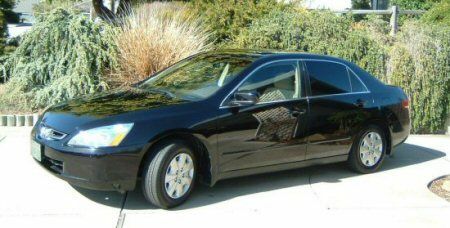 I can’t say why, but one day during my commute, I came to me, and with an examination I confirm my suspicions that the seat belt latch was above the top of the side bolster — much higher than any other car I have driven — and that was digging into my hip. After quickly firing off letters to the Honda dealership, the dealership owner and Honda corporate, I realized that (1) there wasn’t much that could be done and (2) I was unlikely that anything would be done. 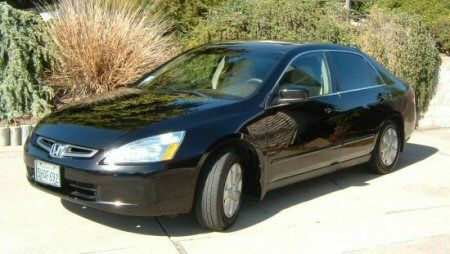 With some quick research and bit of luck I found the Accord (for basically any equal trade and no extra money out of my pocket) and not once have I second-guessed my decision. I, and my derrière, are much happier. P.S. 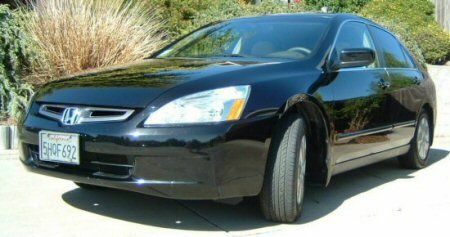 I must commend Honda’s warranty service, as my extended warranty on the ’06 was fully refunded.